Cypress Village,in Little River, is a master-planned new home community being developed on the site of the old Cypress Bay Golf Course which closed several years ago. Although the beautiful views of the course greens are gone, the community that is replacing it will be professionally landscaped and lush. Community amenities will be incredible here. There will be a 3,000 square foot club house with a resort style pool, sports fields and a putting green. 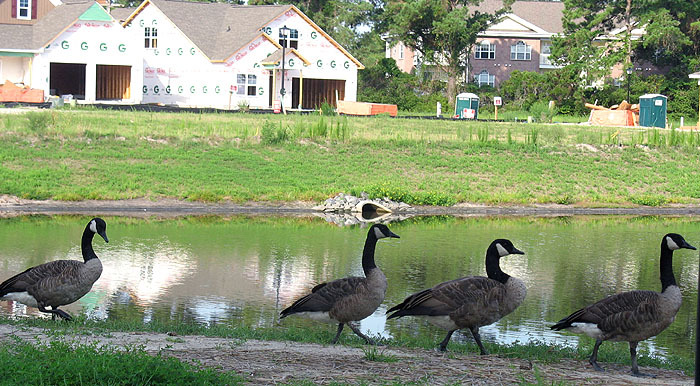 The lake in the center of the neighborhood will be fully stocked and is home to numerous indigenous wildlife including a flock of wild geese. There is a smaller pond at the entrance next to the Garden Condos. The “hausSmart certified” homes built by Mungo Builders feature the latest in energy efficient materials and techniques, providing more environmentally conscious and comfortable living spaces for the owners. Houses offer Natural Gas, Radiant Barrier Roof Sheathing, attic insulation, Air Barriers and Air Sealing, Efficient HVAC Systems, Tankless Water Heaters. While new homes commonly have a HERS rating of 100, Mungo houses are rated around 68 which means they are more efficient, cost effective. 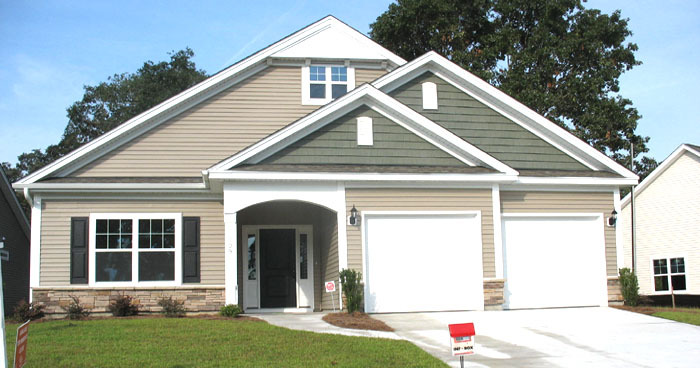 These luxury homes begin in the lower $200,000 and the models must be seen! Hardwood floors, stainless steel appliances, granite counter gas fireplaces and two car garages are just some of the features. Available floor plans include Jensen, Fairchild, Edgewood, Allerton, Bloomfield, Edison, Hartford, Fullerton, and Westbury. Some homes are ready to move into. Future plans will include some town homes as well. Little River has seen a great deal of growth recently with many new housing developments, condos of every kind, and the close proximity to many of the best golf courses. There are also the casino boats and great waterfront restaurants. Taxes are lower than most anywhere because there are no city taxes (yet). Far enough from the Grand Strand to avoid heavy traffic and yet only 3 miles from Cherry Grove Beach, the lifestyle in Little River is relaxed. Boaters will love being near The Myrtle Beach Yacht Club and Harbourgate Marinas. Several 5 star restaurants are blocks away, and just over the bridge are the favorites like Outback, Carrabbas, Chipotle, and all the fast food places you can want. With so much to offer and such a bright future this is a neighborhood to watch! If you are looking for a place to set down roots; a place where you can grow you must see the new homes for sale in Cypress Village Little River.